Never before have I met a 21-year-old quite as in tune with herself and her world as Chloe Gendrow. She greeted me like an old friend, and our conversation was free-flowing and easy. This is part of her charm. She is approachable and understandable. She is adorable and fun. She is honest and real. And these qualities shine through in her music. Chloe has always known that she wanted to make music. “I feel like this sounds cheesy: but I’ve always known that I either wanted to sing or write songs from the time I was very young. It is the one thing that has stuck with me. 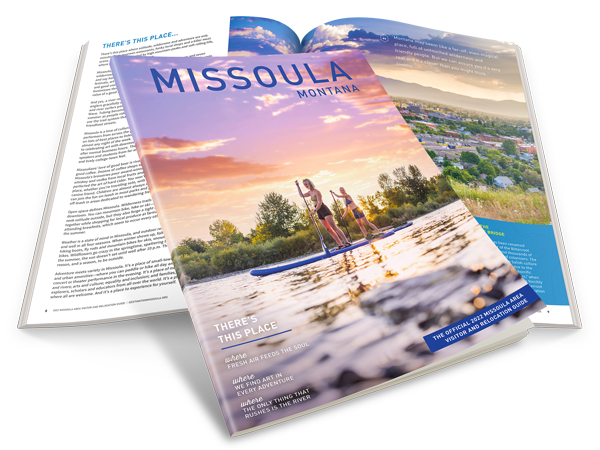 I felt that it was my duty to serve the younger me and give it a fair shot,” she explained as she sat down to talk with Destination Missoula about her music, her life in Missoula, and her plans for the future. I met with Chloe at Le Petit Outre, and as I walked in the shop at 3:55 for our 4:00 meeting, she was already there sipping a coffee at the family-style table in the center of the store. She flashed a friendly smile in my direction, like she recognized me even though we had never met. “I got her early,” she laughed. As I was setting up the recording device, she said, “Just so you know, I am the most awkward person ever when it comes to talk about my music. It is hard to verbalize it. When I make my music, I am in my own little world. I am in my head. I am just doing it for me. I am not thinking of an explanation for it so long as it satisfies my vision. It’s just me in my room making music alone most of the time.” Well, Chloe, that sounds like a pretty good explanation to me! Born and raised in the Missoula area, Chloe graduated from Lolo School and started at the University of Montana in 2013. Despite the fact that she knew music was her chosen career, she felt that going to school and getting a degree was a smart decision. “[Right after high school], I knew if I don’t go [to school] now, it was likely I wouldn’t go back. So [I wanted a] degree that would work with music, but that would also work if and when music fades out. I felt like if I had access to this kind of education I should take it and run with it. So I chose marketing. I tried to be strategic. I had to pick a major that would allow me to pursue music. I will graduate in December 2018. It took me 4.5 years since I took a semester off. I just want to get it over with, to be honest,” she says, laughing a little. And when Chloe says she knew she could make music if she hit it hard, she is not joking. She released her first EP, Growing Pains, at age 19, only a year-and-a-half out of high school. She released her first full length album, Glow, in November of 2017 at age 21. She explains that during her EP, she found that she was creating a lot of music that sounded like other artists on the radio. She laughs, saying that she is a pretty good copy-cat when she wants to be. When she was given the chance to record a full-length album, she knew that if it did not go well, then perhaps her dreams of a career in music could be over. For that reason, Chloe spent the time while she was writing and recording Glow in creative isolation. Chloe did most of the writing and producing of this album in her bedroom with the help and support of her friend Reid Graham, and after a year of writing and two months of recording, she released her album, recorded at Club Shmed Studios in Missoula. In November 2017, Chloe held a release party for Glow at the Top Hat Lounge where she was finally able to unveil her creation to the world. Since then, the reception she has received from fans and producers has grown, something she called bizarre. People reach out to Chloe through email, or Instagram, or SoundCloud. She says that she loves hearing from fans, but it can at time be a shock. Growing up in Missoula, Chloe says she did not know that she was living in such a musically rich place. As a musician living and working in Missoula now, however, she says she constantly feels lucky to have the unwavering support of such a tight-knit community. Because of her schedule with school, it is hard for Chloe to find time to perform. Unlike other performers, live shows are not her favorite aspect of making music. So much so that her DJ is a friend of hers rather than a professional sound technician. “A lot of people who do this would have a sound guy [DJ], but I don’t want to deal with that. I’d rather have someone who I am comfortable with right next to me. I can just look at her and say ‘Go’ or ‘Hold up I’m gonna talk a little bit here.’ I think it would be really cool to eventually have a band.” Chloe, who also plays guitar, says that she prefers to only play guitar at unplugged shows rather than during her production shows, so she can focus on singing, but she also enjoys playing unplugged concerts at coffee shops and breweries in town with just her voice and her acoustic guitar. Chloe says that once she graduates, she plans to pursue music full time. She explains that at some point, she knows that she might have to leave Montana to grow as an artist, but that she also believes riding the wave of internet music is a good option for her. “I will leave when I need to. But Missoula is just such a cozy town to pursue music, and I am just comfortable here and that is why I don’t want to leave. It’s home. It’s familiar.